Oh, iPod games and accessories. Last year, Santa brought Tater an iPod touch, and ever since then, everything that finds its way into our house has something to do with iPod. Today's review is no exception! I knew that the Appfinity AppDrive was going to be PERFECT for him! First of all, the AppDrive is so easy to use. 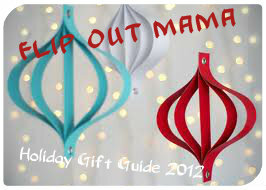 All you do is plug your iPod or iPhone in and you are good to go! The app that you download to use it is free, and downloads super fast! Here's the deal: Get behind the wheel of the ultimate driving simulator. 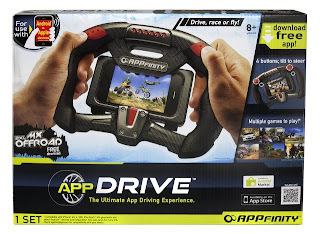 Using patented touch pad technology, the AppDrive puts you right in the race. Your iOS device’s gyroscope delivers 100% authentic steering control as you tilt, twist and turn your way through every race. 4 console buttons deliver shifting, breaking, drifting and more. Customize each one while your race through popular licensed and non-licensed games. 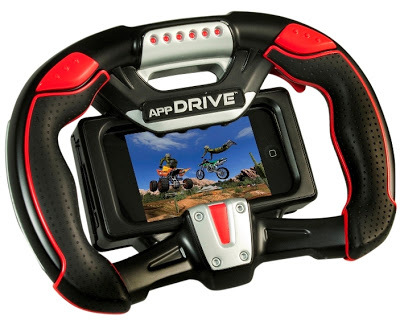 Whether it’s stock cars, planes or motocross, AppDrive puts you behind the wheel. Once you have your app installed and are ready to go, you are ready to race! There are street racing games, flying games, and motocross games, all three! The boys have really enjoyed this app, and we have put in requests to Santa that we please get the AppBlaster and the AppFishing sets as well! Thanks again Spinmaster for another great toy for our boys! If you wanna buy the Appfinity Appdrive, click here! Also, make sure to add Spinmaster on Facebook and Twitter too!